This is one of those cars that I've always wanted to see in real life. I have seen so many shots of it before but now it was time to have a closer look. What we are looking at is a MK4 Golf R32 from 2003 that has been built by G-werks. A shop that offer parts for most of the VAG range with some of the world's leading brands available. They even have a small workshop to work on cars and carry out modifications. It seems that they churn out some really outstanding cars that really have a massive impact on the VW scene. This car right here is a real testament to that because it has been covered on almost every respectable VW blog since it debuted. The guys at G-werks kept the exterior pretty much stock except for the shaved washers and repeaters on the side. In the opening shot you can also see the carbon roof. But I think the most interesting thing is the paintjob. After Darren Bennett – the owner of the car – got the car, he stripped it bare and painted the inside and outside in a Bentley Super Sport color called Ice Beluga. But what it really sets it apart are the wheels and the airride system. Because G-werks is the European importer of Rotiform it makes sense that it has a set from the same manufacturer. The wheels are called the TMB and come in 19"x10" with 225/35/19 Falken tires in the back. And 19"x8.5" running 215/35/19 Falken tires in the front. Then there is the massive drop that has been achieved with a full Airlift Autopilot kit. It has an integrated controller that has been built-in to the rear view mirror. The original filler cap has been ditched in favor of an Audi TT version. For me this car has been a scene changer. What I mean is that when this car debuted a lot of people were outraged by the looks of it. But quickly after that you would see more cars following the same style. 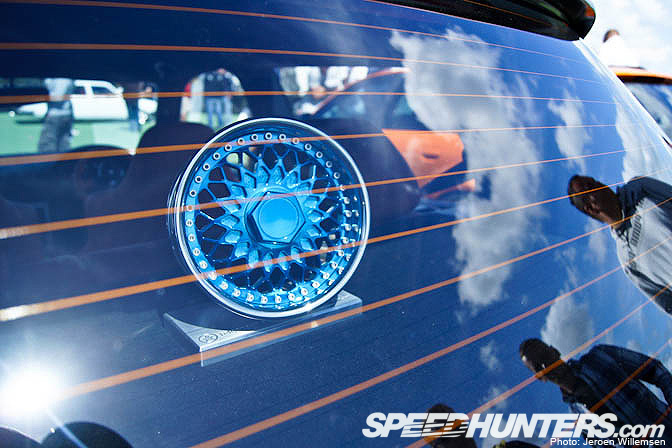 When I was at the show I met up with the people from Felgenoutlet in Germany and they asked me which car should win a trophy for best wheels. I pointed out this car and what do you know when I returned in the afternoon it had this shiny trophy in the back of the car. Not sure if I was the sole reason for them to award the car this trophy but I like to believe I did! What a gorgeous VW.Very easy on the eye. Darren & g-werks build great cars. Always have, always will. why does FWD car have wider tyres on the back? it's not a FWD, it got AWD. yeah it's so cool wheels man! 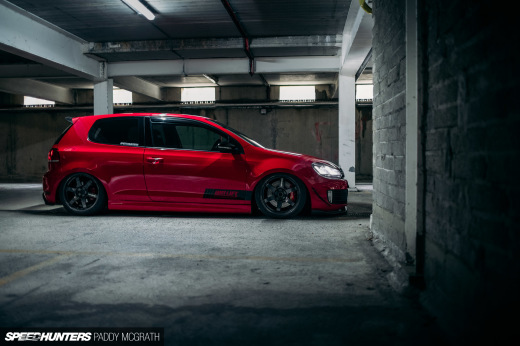 Darren & the guys at G-Werks - UK Rotiform are leaders in what they do, This one of many that the team have rolled out over the years and for me its one of my all time favourite MK IV R32s and its quick believe me. Top article, top car. I'll be honest, I don't think it looks too hot. Something abiout the stance just looks weird, and I think the chrome finish on the wheels work with the rest of the car. Well done, just not to my taste. Its nice to see how G-werks is representing them with a nice Golf and nice rotiform wheels, especially when I as a customer had maybe paid for the wheels, which are on the car. FYI G-werks owes me wheels for 4000 british pounds since 7.3.2011. For all you, who are interested in purchasing rotiform wheels from G-werks - be carefull. There are already several customers from Germany, Slovakia, Czech republic who did not get what they had paid for. Nice work G-werks, carry on. Nice spotlight, gotta love the OEM+ look! GAY. So this "car spotlight" is just a bunch of pictures of how the wheels fit. Oh, they fit just like every VAG (lol btw) on the "scene." The race line wheels from rotiform can take a little longer to produce sometimes. Please check your email or call us tomorrow for a further update on your order. The car looks so clean until you get to the hideous gas cap and the door handles. I would have shaved both of those too to keep a extremely smooth body. The exteriour is not stock, the rear bumper is not a stock R32 bumper.